“Shadow Legacy,” Age of Quintessence book 2, shows author Vista Townsend improving her storytelling. 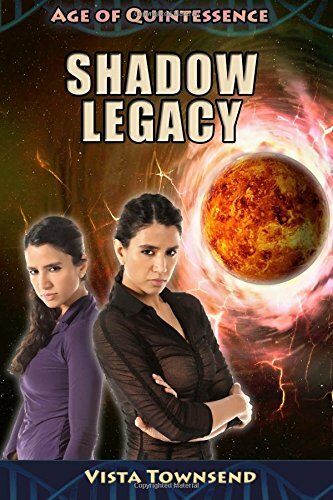 Shadow Legacy follows about fifty after the end of book one in the Age of Quintessence series, Synthetic Genesis. In Shadow Legacy, the quintessences have established themselves as the empire’s primary fighting force, sent to participate in armed conflicts as well as law enforcement. Several different varieties of quintessences have been created, all designed to resemble the various human races. But the original five quintessence still live, and they act as a counsel that oversees quintessence usage and activities. Yashana Kalkar thinks she is an ordinary person, maybe a bit better at school then normal but nothing special. But when a friend’s cyber-prank turns into a serious incident, she learns that she isn’t normal, but a clone of Layla Rangan, the women who created the quintessence almost two centuries earlier. Yashana doesn’t welcome this discovery, and tries to downplay it. But things get even more out of her control when the memories of Layla Rangan are implanted into her own mind, and she has to deal with being two people sharing one body. The first part of the story is actually much like the first book, following a young woman as she goes through school and also has to do some work for the quintessences. It’s mostly a city and university setting, with some futuristic features. Volodymyr, on the other hand, is one of the more unique settings I’ve come on in my sci-fi reading and viewing, both for the nature of the location and for the reasons people of various alien races are there. As mentioned in the summary, the memories of Layla Rangan, and what is, for lack of a better word, her personality, are put into Yashana’s mind. For a while, this doesn’t go well, as the woman who was well over 100 years old when she died fights the girl who is over 100 years her junior over things like what foods to eat and what term papers to write. And should we have a crush on the Yashana’s computer geek schoolmate, or plan to marry Ariyo, the quintessence who now also has the memories and personality of Layla’s husband Alexander, one of the original five quintessences? This could have been the main theme of the story, and that might have worked out well, but a resolution is made between the two, and what comes of it is Lashana, and her adventures in the second half of the book are an interesting combination of what the two personalities might do. But the quintessences’ ability to extract, package, and share memories becomes a bigger issue among them as the story goes along. The remaining original five are aging, and their normally super-human bodies are starting to fail them, so this ability to pass down memories and personalities comes to be seen as a way to pass along their knowledge and experiences to new leaders, with the downside that the receivers of these memories will themselves lose much of their own personality. Christian references appear a bit more in this book then the first, though religion is often a background thing for the characters. Issues of forgiveness and reconciliation come up. Rather ticklish issues arise: are Layla and her former husband still married even though they each occupy different bodies? Does Lashana commit a kind of adultery when she later marries a human man? But this is more then just a rather bizarre romance story. In a universe with many different alien races roaming about and learning how to get along with each other as well as step on each other’s toes/fins/claws/whatnots, there are people who think that humans should be at the top of the political food chain. And as Ariyo looks into who caused the explosion that led to the death of Layla’s husband — when the memories of Alexander and Layla were passed on — he must consider when allies of the quintessence might have taken things too far. I think this story is in many ways a solid step up from the first story in the series. There are more non-human races portrayed, as well as a more alien and hostile setting in Volodymyr. The story itself is more complicated, the conflicts more creative, and the personalities of Ariyo and Lashana are more intricate and life-like then characters in the first book were. There was one thing that needed some work. There were times in reading this book that I thought the characters simply “sounded” too much like each other, especially given the alien and non-human cultures some of them came out of. Overall, I pretty well enjoyed this story, finding it a satisfying story that was well worth reading. Audie Thacker likes to think of himself as a writer, and so far his word processor hasn't been able to convince him otherwise, though one can't fault its efforts. He is the author of the fantasy novels Shifters: Manipulations and Shifters: Judgments.